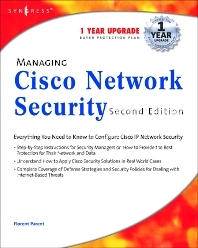 An in-depth knowledge of how to configure Cisco IP network security is a MUST for anyone working in today's internetworked world "There's no question that attacks on enterprise networks are increasing in frequency and sophistication..."-Mike Fuhrman, Cisco Systems Manager, Security Consulting Managing Cisco Network Security, Second Edition offers updated and revised information covering many of Cisco's security products that provide protection from threats, detection of network security incidents, measurement of vulnerability and policy compliance and management of security policy across an extended organization. These are the tools that network administrators have to mount defenses against threats. Chapters also cover the improved functionality and ease of the Cisco Secure Policy Manger software used by thousands of small-to-midsized businesses and a special section on the Cisco Aironet Wireless Security Solutions. What Role Does Security Play in a Network? What if I Don’t Deploy Security? Where Does Security Fit in? Chapter 2 What are We Trying to Prevent? What Threats Face Your Network? Why Should You Have an IDS? What is the Cisco Secure Network Intrusion Detection System? Where in the Authentication/Association Process Does MAC Filtering Occur?